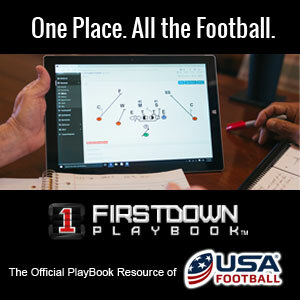 Today FirstDown PlayBook is going to follow up on our post from this past Monday where we detailed out the Texas Longhorns and the quarterback power that they ran for a touchdown in the Big 12 Championship game. The closer you look, the more you realize that they had a complete quarterback package out of the unbalanced formations and it was well thought out. The two football plays we have drawn up for you are nothing special in as far as the scheme goes. What we mean by that is that one is a quarterback power and the other is a quarterback counter. Nothing revolutionary there, just gaining an extra man on two very common blocking schemes. What we were impressed with is how the offensive coaches knew what Oklahoma would likely be lined up in and they took advantage of the backside defenders’ man coverage responsibilities on both plays. We often point out here that college and high school coaches are more open to exposing their quarterbacks in the run game than at the NFL level and that makes sense as the hits they take are not nearly as vicious. High school and college quarterbacks are also more easily replaced than NFL quarterbacks during the course of a football season. however, you still are better off if you are going to run your quarterback to protect him in any way possible. Texas did a good job with this unbalanced quarterback counter because it lessened the possibility of a backside defender coming over the top and taking a free shot on their quarterback. You can bet that Kirby Smart’s Georgia defense will be well coached up on these unbalanced formations. You can also bet that Texas will have bootlegs and play-actions built in off of these runs for the bowl game as well!